The PROXPAD is a combination of two separate units, the 23-206 proximity reader and the 26-100 keypad in one housing. The outputs can be wired together allowing the units to work as one or they can be left separate providing two units in one enclosure. * All proximity cards entered into the system will operate relay A (Default setting). * All proximity cards entered on PROX 1 will operate relay A, and all cards entered on PROX 2 will operate relay B (SPLIT RELAY FEATURE). The relay output times are user selectable from 1/2 to 9 seconds and provide a normally open (N/O) and normally closed (N/C) output. Make sure to read and understand all instructions before proceeding with each step. What do you get when you combine the latest in proximity technology with a proven keypad? The American Access Systems, Inc ProxPad system! 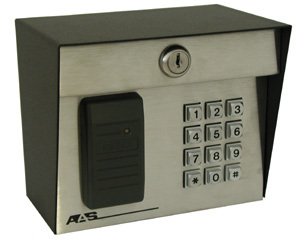 This model is built for years of trouble free use by utilizing a rugged, heavy metal, black powder coated enclosure and high grade stainless steel faceplate. The ProxPad can be conveniently configured for use as a stand alone system, or as a remote slave system that can hook up to almost any 26 bit weigand controller (including the AAS ProAccess 200 computer controller). Each ProxPad unit can further be setup to use the prox reader and keypad independently of each other, or to use them in conjunction, allowing for higher security by utilizing both card reader and pin code to fire the relay.